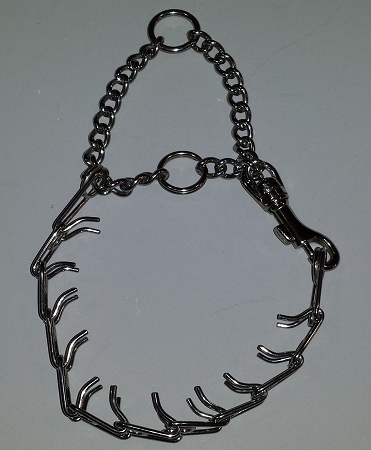 The micro prong is designed for smaller dogs weighing 10 lbs -30 lbs. Due to the small size, we can not add leather to these collars. Measure your dog’s neck up high right behind the ears. Add 2 inches to find the correct number of links to order. The collar should not slide down the dog’s neck; you want it to stay high on the neck for best results. With a snap to connect the collar you avoid stress to the dog while trying to pinch together links to put the collar on and take it off. It also avoids stress to your fingers and hands! Easy to use for older or arthritic hands.